Since the 1990s, sea cucumber stocks have been over-exploited worldwide and in sharp decline due to the growth of Asian markets. Overfishing affects most commercial species. 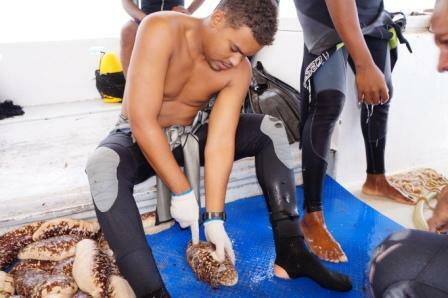 In the southwest Indian Ocean region, the sustainability of sea cucumber fisheries in the Seychelles is an exception and is a major national issue. 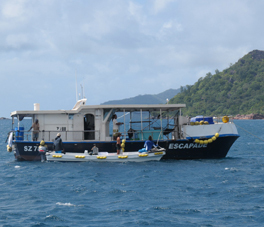 In this context, the overall objective of the SEACUSEY project is to ensure the sustainability of the economic sector related to sea cucumber resources in the Seychelles through adaptive co-management. 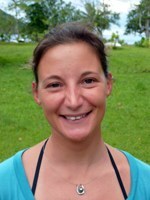 Its specific objective is to define and implement operational management measures for sea cucumber fisheries that are adapted to the diversity, genetic structure, abundance, distribution and evolution of stocks of the four main commercial species (Holothuria "pentard", black teatfish H. nobilis, white teatfish H. fuscogilva, and sanpye Thelenota ananas). 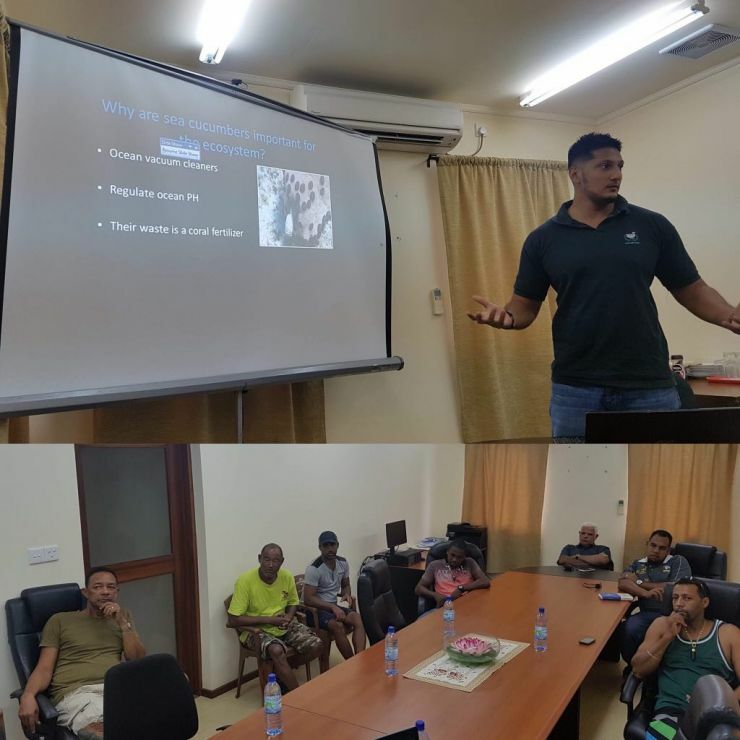 In order to achieve these objectives, the SEACUSEY project was prepared and is carried out in association with the key actors of the sector in the Seychelles: SFA, AMSSI, and the Sea cucumber harvester association (SCHA) that was established in January 2018. Outcome 1. Characterizing the diversity of sea cucumbers and their genetic structure in Seychelles. Although they have been commercially exploited for more than 100 years, the sea cucumber species of the Seychelles remain paradoxically poorly known. The SEACUSEY project proposes to analyze the genetic and morphological characteristics of these resources in order to characterize them more accurately. Firstly, outcome 1 accurately determined size at maturity for the main commercial species, which is an essential parameter for the management of these resources. 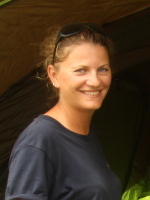 Secondly, through the analysis of molecular markers, result 1 provided information on the spatial structure of the populations of the two main commercial species at the archipelago scale, which, given the immensity of the fishing zones, will help defining the management units for these species in Seychelles. Outcome 1 of the SEACUSEY project thus provided knowledge on the maturity size, ecology and genetic structure of sea cucumber resources currently exploited in Seychelles, which represent a necessary basis for determining conservation and management of commercial species adapted to each stock. Outcome 2. Proposing management measures through adaptive co-management. Component 1: Output 2 contributed to the co-management of the fishery. This knowledge focused on the abundance and distribution of major commercial stocks, estimated by optimizing participatory monitoring of fishing operations. This biological information was lacking in Seychelles, which undermined the co-management process. In particular, by comparing the biological performance of management with the economic performance of the sector, result 2 helped adjusting regulatory measures of the fishery. 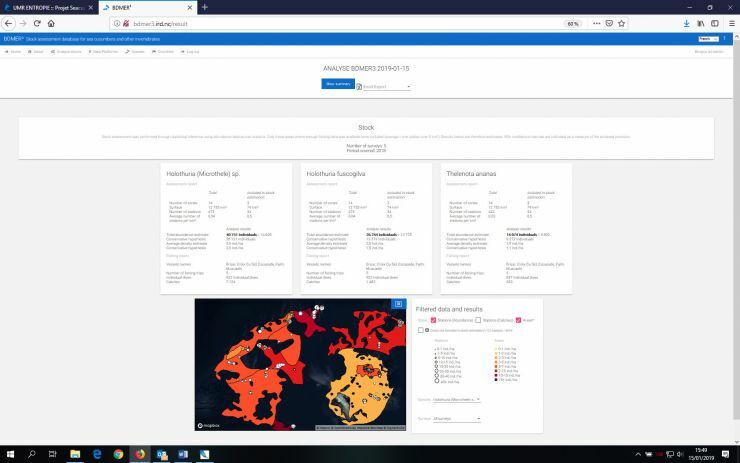 Optimization of fishery management costs through semi-automated tracking data collection and processing procedures (which requires lower involvement of SFA's human resources). Outcome 2 therefore strenghtened stakeholders' technical and financial capacity and autonomy. Overall it contributed to optimizing the contribution of the fishery to the country's economic development over the long term. This activity was eventually canceled bue to data collection issues in early 2018 following change in fishery context. In December 2017, after the official opening of the sea cucumber fishery in October 2017, the SFA had announced that there would be a total ban on the harvesting of H. nobilis, one of our target species of the SEACUSEY project. Therefore, it was decided that we would remove this species from our sampling efforts, and concentrate on the three most targeted species: Holothuria “pentard”, white teatfish H. fuscogilva, and sanpye Thelenota ananas. This SEACUSEY activity was initiated at the start of December 2017, during the predicted spawning season of the three species. 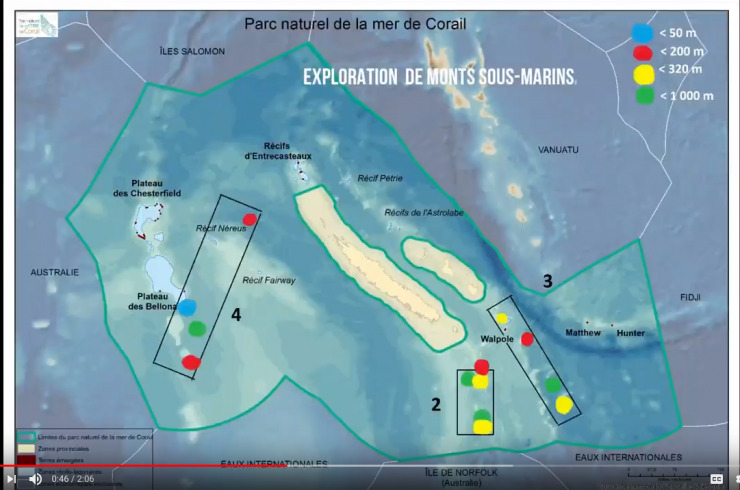 A first sampling campaign was carried out in early February by the Project Officer, members of the SFA research team, and M. Léopold on board R/V L'Amitié. During this campaign biological samples and biometric measurements (i.e. individual weight, length and width) of 70 specimens belonging to Holothuria “pentard” and white teatfish H. fuscogilva were collected (see the video). The team discovered that sanpye Thelenota ananas were not found at all within this first study site. This may have been due to fishers specifically targeting the other two high value species. 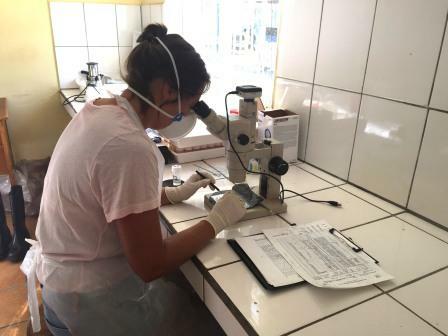 A second sampling campaign was carried out in early March, whereby the team traveled to the Amirantes region. During this campaign, biological and biometric measurements of 31 specimens belonging to Holothuria “pentard” were collected. The team discovered that Thelenota ananas and H. fuscogilva were in low numbers, or not found at all within this region at the time. Overall, it was seen that the collection of gonad samples remained lower than expected (i.e. 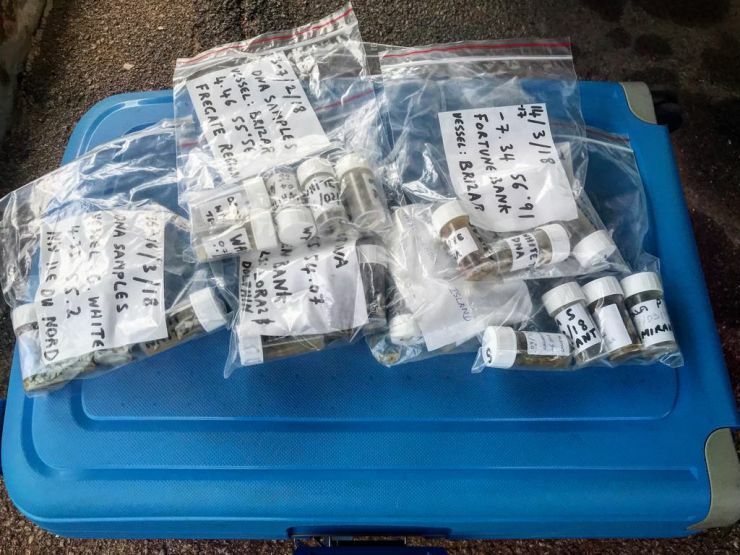 93 samples of Holothuria “pentard” and 9 samples of white teatfish H. fuscogilva), making it possible to carry out statistical analyses only for Holothuria “pentard”. 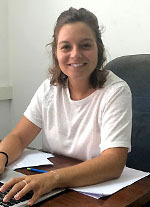 Ms. Salomé Cahuzac, a biodiversity Masters student from the University of Marseille, France did a two-month internship with SFA and IRD in March and April 2018, specifically recruited for the gonad sampling phase of SEACUSEY project. 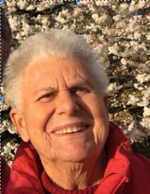 Her responsibilities included macroscopic analyses of the gonad tubules of Holothuria “pentard” and H. fuscogilva to determine the size at sexual maturity. Her report is available here. From the samples that were collected, the size at maturity of pentard was estimated at 30 cm (+- 2 cm). This study provided the first data on the reproductive biology of this species. 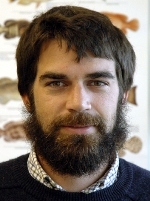 The results provide guidance for further research investigation and fishery management. They will also be used to develop a protocol to aid future studies of this nature at the SFA. The study will be published in the SPC Bêche-de-Mer Bulletin in 2019. 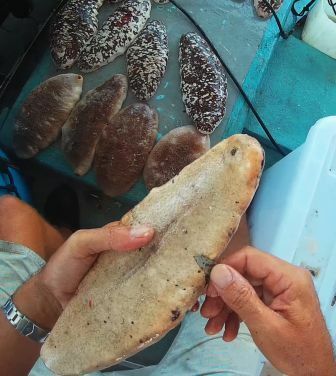 Before the harvesting ban of black teatfish H. nobilis, specimen samples of all four harvested species were taken during a cruise on the professional fishing vessel L'Escapade in July 2017. The samples were transferred to the University of La Réunion, and later to a French company specializing in the development of microsatellite markers. Those markers are now available for the four species. DNA sampling of the three authorized species commenced during biological sampling cruise in February 2018 (see the video), followed by the second cruise in March. 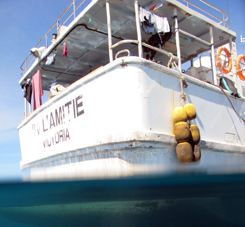 It was becoming apparent that sampling campaigns using R/V L'Amitié were not as frequent as was hoped. This was due to logistical constraints, as well as rough weather conditions persisting. 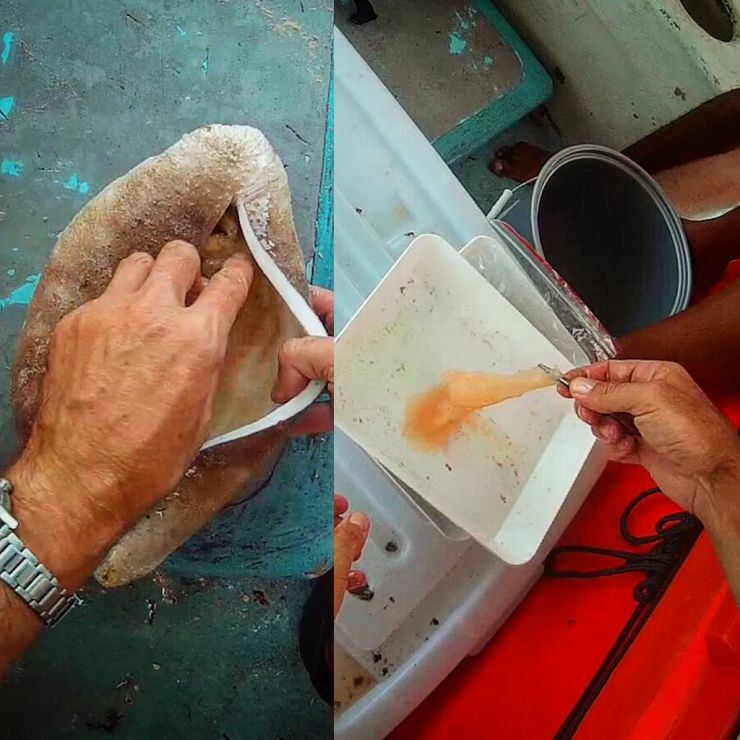 Therefore, the Project Officer enlisted the help of some of the fishermen in the fleet to help with the DNA collection of the sea cucumber species during their commercial trips. 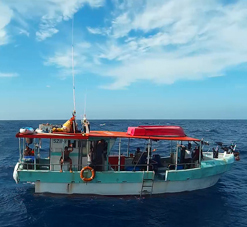 Constant meetings and training exercises were held by the Project officer and at sea in order to prepare the fishermen for the data collection. Adding to this, the project officer also collected salted DNA samples when vessels returned to port for discharging their catch. 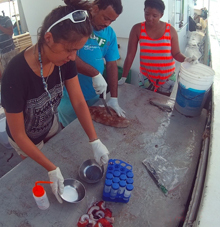 Through these exercises, we were able to gather 950 DNA samples: 437 samples of Holothuria “pentard”, 348 samples of white teatfish H. fuscogilva and 165 samples of sanpye Thelenota ananas from eight regions around Seychelles. 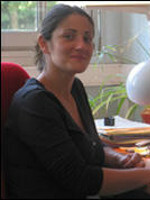 DNA analysis was carried out by H. Magalon at the University of La Réunion, consultant N. Oury in La Réunion, and C. Fauvelot at the IRD France. Results showed that was a single stock of Pentard and white teatfish, although small, significant genetic variability was observed across sampling sites for the latter species (see more results here). This difference likely occurred due to the overall low abundance of white teatfish throughout Seychelles. There were too few sanpye samples for conducting a robust analysis for that species. 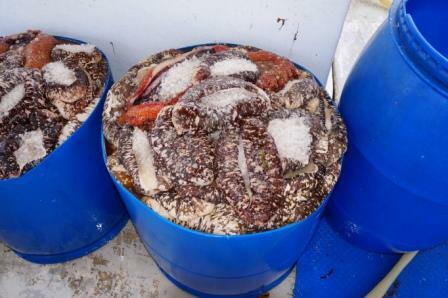 Two surveys of the L’Amitié research vessel were conducted on June 16-17 and July 4-18, 2017, north of Praslin Island, to conduct an experimental sea cucumber fishery. Three professional fishermen, a professional skipper, the research division of the SFA and the IRD participated. A student was hosted on the IRD and the SFA to accompany this operation. 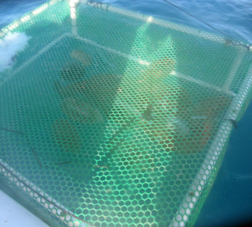 The experiments made it possible to measure the catches of each of the fishermen according to a sea cucumber density gradient under real conditions. A statistical model was developed based on experimental fishing data and underwater visibility parameters. The study report is available here. 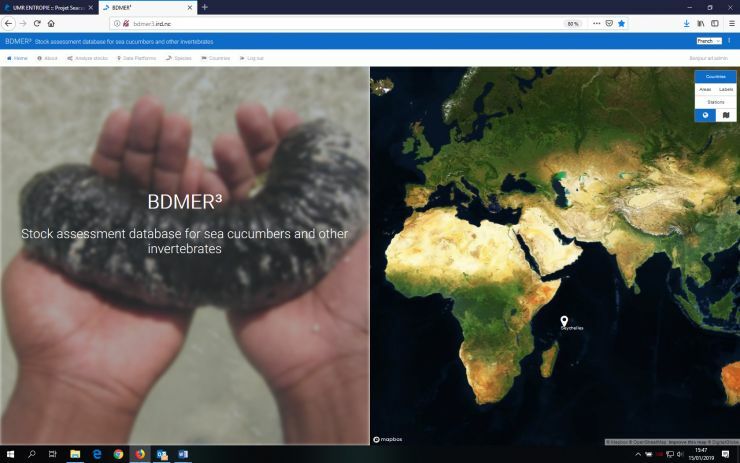 The model was transposed to logbook data that is routinely collected by the SFA to estimate and map the abundance of sea cucumber resources in the Seychelles using BDMer 3.0 tool. The next step of the study was to accurately estimate commercial CPUE. To date, CPUE estimates have indeed been based on ‘total dive time’ that is recorded in the logbooks. However, this estimate fails to take into consideration the actual time spent fishing, as safety stops. The project looked at ways to improve this estimate. Over 2018, six commercial sea cucumber divers from three fishing vessels were given pressure recorders that were attached to their BCDs. 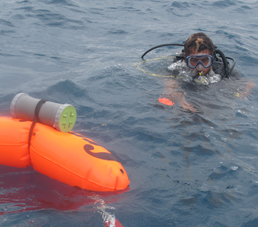 These recorders accurately mapped the depth profile of 621 dives. 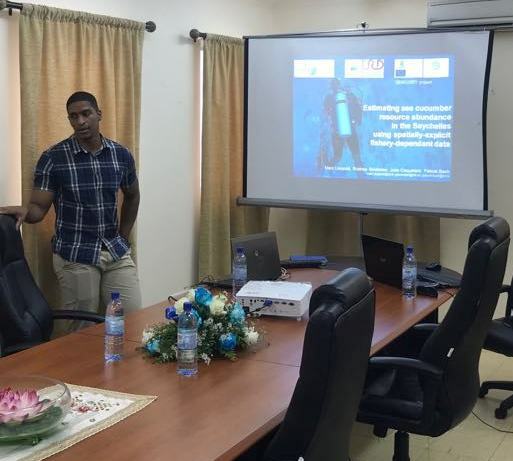 F. Rakotonjanahary, a student at the Institut halieutique et des sciences marine, University of Toliara (Madagascar) from June to September 2018, contributed to build a statistical model to better estimate the actual fishing time (see his report here). This model predicts effective fishing time per dive based on depth and total dive duration, which suggests that "true" fishing time (and therefore CPUE) can be estimated at reasonable accuracy using logbook data if skippers make accurate declarations (see a presentation of that activity during the national workshop here). The specifications of the BDMer 3.0 information system were defined by the IRD, according to the needs expressed by the SFA. 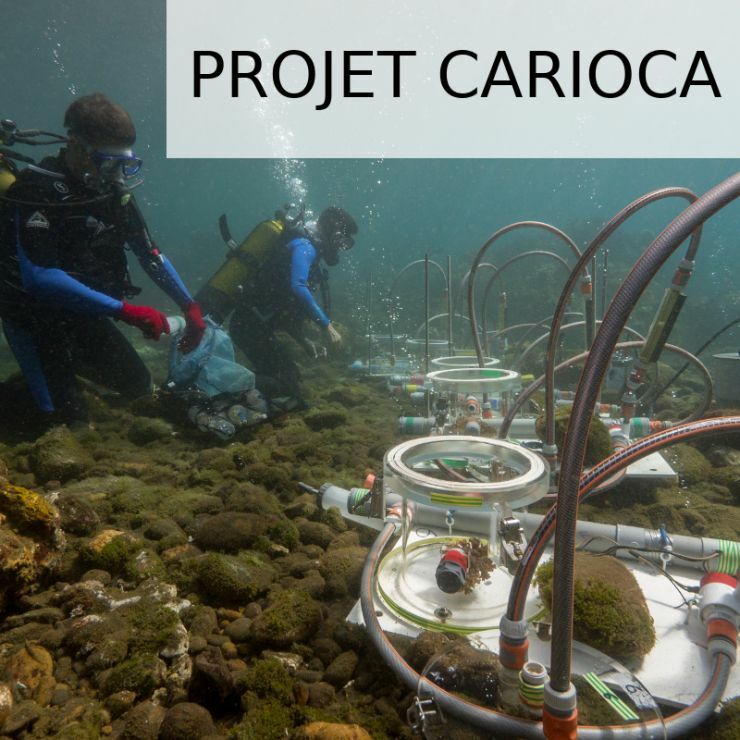 This information system is intended to facilitate the routine estimation of the abundance of exploitable sea cucumber resources using fishing records. The procedure is as follow. 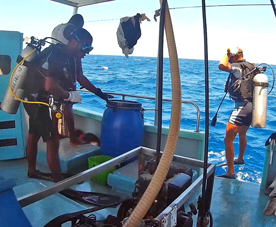 For each dive, catch data are first converted into density estimates using the statistical models described above based on catch records per species, total dive time, depth, and number of divers. Statistical inference is then used to derive abundance estimates. 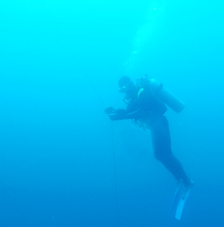 G. Lahitsiresy Max, a student at the Institut halieutique et des sciences marine, University of Toliara (Madagascar) from June to September 2018, mapped 180 zones according to depth (10-50 m), sea bottom substrate, and fishing areas (see his report here). These zones were used as statistical strata in the statistical procedure in BDMer 3.0. The computer developments were carried out at the IRD center in New Caledonia. They were partly completed during M. Dubois's internship in April-August 2018 (see his report here). S. Fiat (IRD New Caledonia) visited SFA in July 2018 to install the data server and a preliminary version of the system. The final version of the tool was made available in December 2018 following numerous interactions with SFA. Only SFA has access rights to the system. BDMer 3.0 now allows for 1) estimating total abundance of sea cucumber stocks per species, 2) mapping sea cucumber catches in each dive location, and 3) mapping sea cucumber density in dive locations and zones as displayed below. During the project, regular meetings were held with partners and associates in the industry. 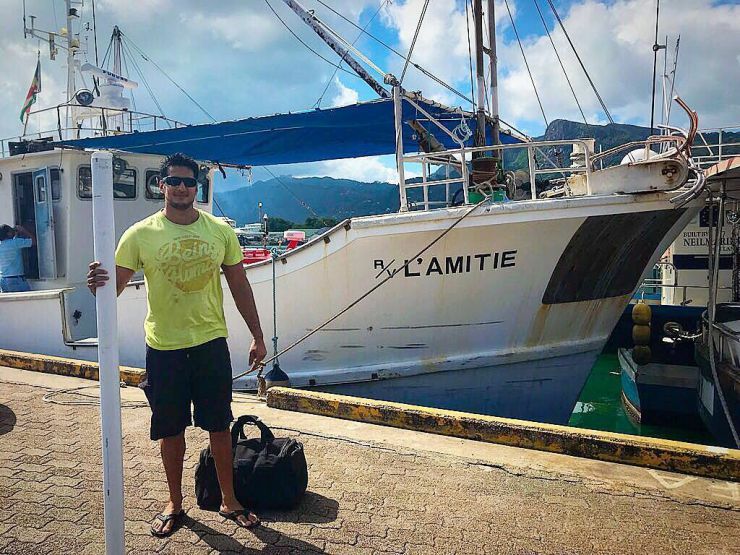 Specifically M. Léopold and A. Ebrahim met with Mr. Paul Morin, chairman of the AMSSI, and Mr. Marcus Quatre, chairman of the newly-formed Seychelles Sea Cucumber Harvesting Association (SCHA) (and also a skipper on board sea cucumber vessel ‘Brizare’). At a meeting in January 2018, they were briefed on the project objectives, and were presented with a poster that demonstrated the outcomes of the first phase of the project. Mr. Morin and Mr. Quatre expressed their gratitude and enthusiasm of the activities of SEACUSEY. Project partners also regularly met with the Deputy CEO of the SFA, Mr. Calvin Gerry. The deputy CEO was briefed on the overall project outcomes and procedures. The project objectives were well received, and it was made clear at these meetings that the SFA will continue to endorse the activities of the project into future seasons of fishing. 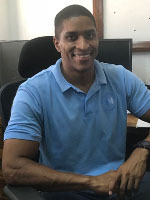 Mr Gerry has since communicated about the SEACUSEYresearch program at the national management advisory committee (MAC) for sea cucumber fisheries, that was held several times in 2018. The project has complemented the expertise provided by the MRAG in July 2017 based on the analysis of the fishing sheets and the VMS data available on the trips of licensed vessels. In April 2018, the project partners highlighted that by strengthening the fishery’s technical capacities and optimizing management costs, the project will support the SFA’s management role in collaboration with the sector’s stakeholders. Over the longer term this will inform discussions about the relevance of a future national sea cucumber fishery co-management plan. Stakeholders expressed their thanks and appreciation for the research work that was undertaken during the project. 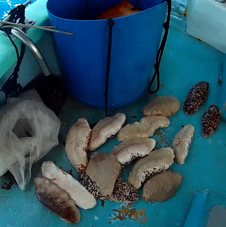 They expressed the need for continuation of the research work as 18 months is quite short to carry out a comprehensive study on the sea cucumber fishery. The IRD developed a Smartphone application (which is an electronic logbook) for the Seychelles sea cucumber fishery using ODK Collect tool. This app is coupled with the BDMer 3.0 information system to ensure a fast and secure transfer of fishing data for processing. A first version of the app was communicated to the SFA in November 2017. In 2018 the project purchased waterproof smartphones that were distributed to several voluntary skippers for the purpose of data recording using the app. The phones remain property of the SFA. 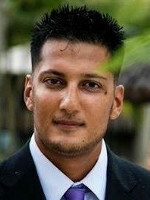 During that year, the Project Officer, Ameer Ebrahim, and SFA partner Rodney Govinden hosted several workshops to educate the use and efficiency of the app to management bodies of the SFA, associated partners (AMSSI and SCHA), and most importantly to the skippers that will be using the app on their trips. The overall impression of the app was well received. The app was finalized following feedback from the partners and trialed in April 2018. The new monitoring system was successfully put in place when the new season reopened in October 2018 for a one-year trial, until the end of the fishing season on May, 31st 2019. Smartphones have been provided to voluntary skippers and collected at the end of each trip by SFA's compliance officers. 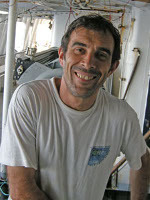 During the first two months, fishers asked for adjustements of the data entry procedure due to several minor issues with the app (for instance, location acquisition by the smartphone may take several minutes if the phone is used within the cockpit). R. Govinden of the SFA's Research section downloads data from the smartphones onto a specific server located at SFA. After a quality check, the data is automatically processed to estimate sea cucumber density in each dive location (using the models from Activity 2.1.1), and then uploaded to BDMer 3.0. Stock assessment will be performed once sufficient data is available to ensure statistical robustness of abundance estimates. If the trial is fully successful, it is expected that most skippers will use the app in 2019 instead of the traditional logbooks, which would greatly facilitate and improve the monitoring of the fishery. The SFA purchased additional smartphones in January 2019 to be ready for that event.